Nagorno-Karabakh, an ex-Soviet region landlocked in the South Caucasus, has been fighting for its independence from Azerbaijan for over 25 years. Although an eternal ceasefire ended the war, violent outbursts are still happening today. Pablo Garrigós, a Spanish photojournalist, travelled through the region’s mountainous heights to tell the stories of young people living there. Nagorno-Karabakh is in a stalemate. This is a result of the 6 year long Nagorno-Karabakh War, in which Armenia and Azerbaijan fought to claim the territory. The war ended with an eternal ceasefire in 1994, but neither side has agreed to sign a peace treaty and the situation hasn’t progressed since then. The ceasefire agreement, put in place to avoid more bloodshed, has not been entirely respected either. Both sides of the conflict have reported breaches of the ceasefire up until today, almost 25 years after the agreement was reached. Up to 30,000 people have died in this war over no man’s land that started in 1988, the BBC has reported, and the death toll keeps rising. Today, the Republic of Artsakh (which is also Nagorno-Karabakh’s new name, ed.) governs the region de facto, but no member of the United Nations recognises it as a country. As a result, Nagorno-Karabakh is neither at war nor at peace. 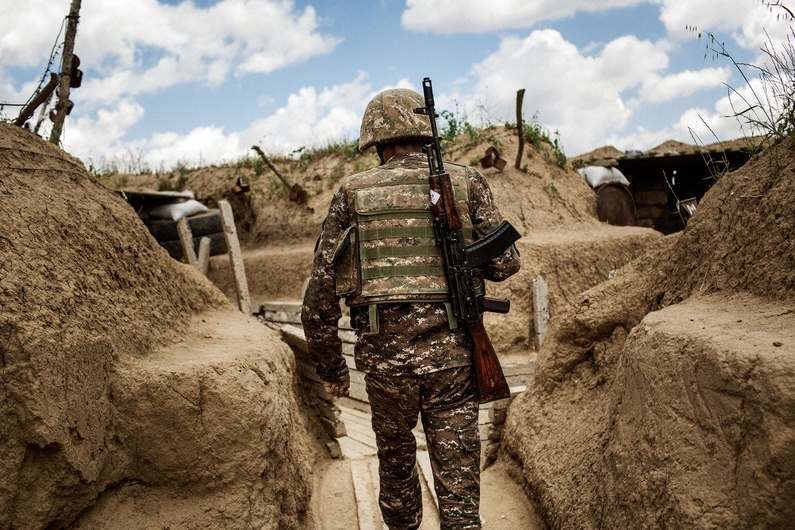 Still, people living in Nagorno-Karabakh feel the war-like atmosphere on a daily basis. Primetime TV is littered with military shows, and patriotism is an underlying theme in many movies, music and theatre plays. Given that the region is unrecognised poses major inconveniences for its inhabitants, they are the ones who feel the weight of living in a disputed territory the most. For example, almost no country accepts Artsakhi passports. Most people hold Armenian passports, the country with which Nagorno-Karabakh shares close cultural ties. Without this passport, it would be impossible for them to travel outside of the region, which is as small as a third of Belgium. 150,000 people are currently living there, ‘trapped’ in a region made up of small villages hidden behind vast mountains that can reach up to 3,000 metres above sea level. Mountains are so prominent in the area that they are considered a symbol of this territory. Pablo Garrigós, a young Spanish photojournalist, travelled to the forgotten republic to find out what life is like for young people in a disputed territory. He first set foot in Nagorno-Karabakh years ago as an observer for the parliamentary elections in 2015. To get there, he flew to Yerevan, the capital of Armenia, and travelled by bus through the windy roads of the region’s mountain ranges for more than six hours. Stepanakert, the capital of the Republic of Artsakh, has an airport, but Azerbaijan has blocked all commercial flights from landing there for security reasons. Seeing what was happening first-hand, the Spaniard decided it was imperative to show the world the human face of this frozen conflict. Young people in the area are soon to become the next generation of potential peacemakers. Still, with constant breaches of the ceasefire hampering their development, their lives are often put on hold. Garrigós presented his work in an exhibition in Brussels over the course of three months last year, but admits that it has been difficult to sell his story to the media: “It’s a paralysed conflict,” he says. In April 2016, sporadic attacks from both sides of the conflict led to a serious four-day clash. Grigor, a 25-year-old construction teacher, was one of many young men prompted to leave everything behind and pick up their rifles. Trained in France thanks to the support of a Franco-Armenian organisation, Grigor had returned to his homeland to set up a youth hostel in a house he had bought. But being an entrepreneur in an unstable area that is prone to violent outbreaks is arduous to say the least. “When you go to the front, you don’t have time to think about what you’ve left behind. The first day, you wonder if you will survive. The second day, you realise you could have died the day before. The third day, your mentality changes: you start living for your country and not for yourself,” Grigor told the Spanish photographer. Social life in Artsakh’s landlocked, sleepy countryside brings back hobbies from past times: “People just hang out in public squares and wander around their small villages,” Garrigós explains. Things like having a drink with friends are simply not feasible. “You can’t be in the streets after midnight without raising suspicions,” the young photographer points out. 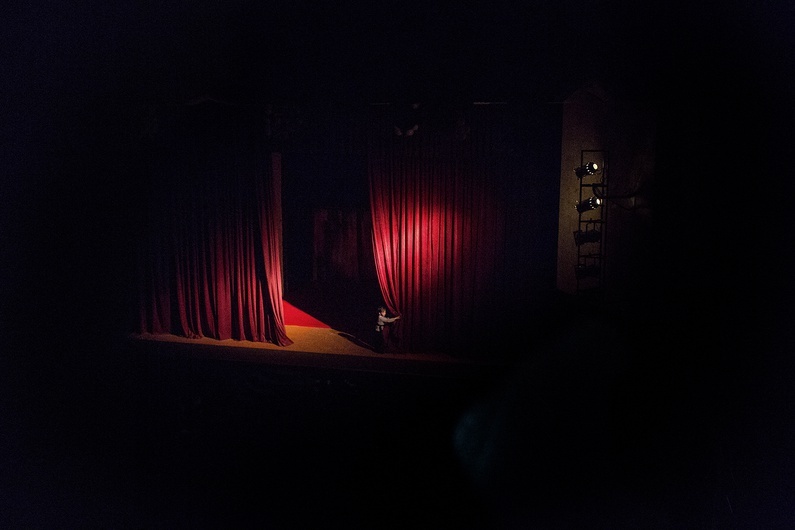 Acting in theatre is something many young Artsakhis have committed themselves to, to stay entertained: “Theatre plays are good to entertain civil society as well as the military. It’s also a useful way to propagate patriotism,” Garrigós reveals. But engaging in any kind of long-term activity is wishful thinking, given the region’s volatility. In the same April 2016 outbreak, male actors of the ‘national’ theatre group of Karabakh had to leave overnight, in the same way Grigor left his hostel project behind. Although Artsakh’s main activity is agriculture, along with some copper and gold mining, many young people choose to go against the tide and study at the Nagorno-Karabakh State University (now called Artsakh University, ed.). Nana, 26 years old, is one of them. She previously studied political science in Yerevan, but her life turned upside-down when the Minister of Education of Artsakh asked her to come back home to finish her studies. She is now the second woman ever in the region to have undertaken a PhD in political sciences. When speaking to Garrigós, she expressed a strong sense of responsibility towards her motherland. “I believe I can do much more for my country and be much more effective than in Yerevan. Besides, there is nothing more important to me than helping my country and there is nothing better than doing it from here,” she explained. Resolving the conflict won’t be easy, but young Artsakhis are determined to carry on working on their long-term projects. “They say: ‘I have to keep on living’,” Garrigós explains. “It’s admirable to have faith in an uncertain future, when this is not going to be easily solved,” he adds. Youth in Nagorno-Karabakh are aware of the fact that finding peace will be difficult. Even if peace does come, the young people that Garrigós interviewed said that they will need at least 50 years before they can live in harmony with Azerbaijan. Both the Armenian and Azerbaijani government have said that they want peace, too, but their conditions are incompatible. The Armenian government supports the independence of the disputed territory, which is inhabited by an Armenian ethnic majority. Azerbaijan, however, wants to create a sort of ‘autonomous region’ on Azerbaijani soil as a solution. So far, no one has been able to change these conditions. Not even the Minsk Group, an international negotiation body set to mediate between the two sides, which is co-chaired by ambassadors from Russia, France and the United States. Hikmat Hajiyev, spokesperson for the Azerbaijani Ministry of Foreign Affairs, insists that his government wants peace. “It would be a game-changer for the Caucasus,” he says, adding that: “Armenia would benefit from peace and cooperation in the area… Young people are spending their time among trenches.” Hajiyev advocates building up trust and confidence between the two sides, allowing for regional cooperation to flourish in the Caucasus region, eventually leading to a “shared prosperity”.